Elena Tobisch spoke on Monday 28 July on the dynamic energy cascade. The talk began with a review of the main historical concepts and theories for cascading: Richardson (1922), Kolmogorov (1941), and Zakharov (1967). A new theory was proposed to fill the gap: the dynamic cascade. Building on the sidebands from a modulational instability, the theory predicts a cascade of energy into additional sidebands, and the detailed cascade is predicted by the “chain equation”. The theory was applied to focussing NLS, water waves, and mKdV. 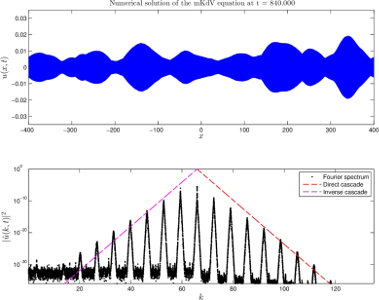 Numerical results, in collaboration with Denys Dutykh, on the mKdV cascade, demonstrated the effectiveness of the cascade and supported the theory. See the previous blog post for further details and references. The theory is supported by observations in the experiments of Tulin & Waseda (1999), Denissenko, Lukaschuk & Nazarenko (2007), and Xia, Shats & Punzmann (2010). A video of the talk is available here.